Because I’ve been running ragged and because I’ve neglected my blog readers. I am extending my Black Friday + Cyber Monday Deal until the end of this week. Simply message me to take advantage until Friday at 5pm. All shoots booked under the discount are eligible to be used until the end of February. Whereas anyone planning a wedding can use the discount until the end of June. $200 gets you a one hour session with me and all retouched images. I will assist you with wardrobe choices before hand and direct you through poses on the day of the shoot. 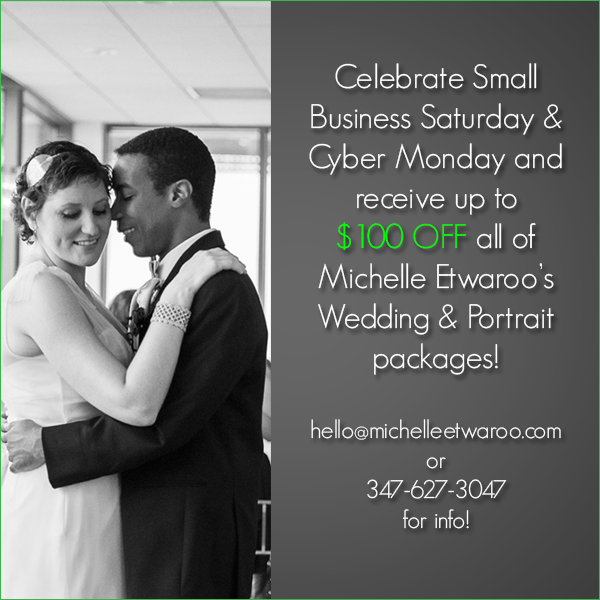 For all my folks tying the knot, receive a $100 discount off of services. Reserve your date before the week is out! This entry was posted in portraits and tagged boudoir, bride, brooklyn, discount, headshots, new york, photography, specials. Bookmark the permalink. I love the Grand Army Plaza photo. It reminds me of The Arch de Triumph. Brooklyn is just as architecturally beautiful as any other city in the world. I have not lived in Brooklyn since 1990 and I know that it has changed a lot. It is the new Manhattan.